In February 2009, researchers from TNO (the Netherlands Organisation for Applied Scientific Research) conducted tests in San Antonio, Texas, commisioned by the Dutch civil aviation authority Inspectie Verkeer en Waterstaat (equivalent to the U.S. FAA). The goal was to assess the effects of distraction, glare, and flashblindness on a helicopter pilot and his observer passenger. 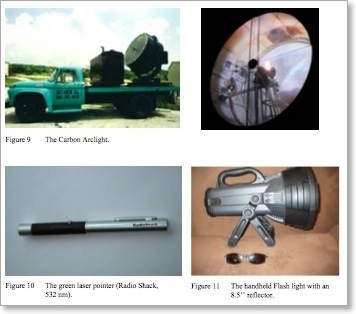 The result was that searchlights were deemed to “cause no concern” outside of the area immediately around a runway, while even a small, U.S.-legal laser pointer was “unacceptably bright and caused serious glare.” Below are details taken from the study. 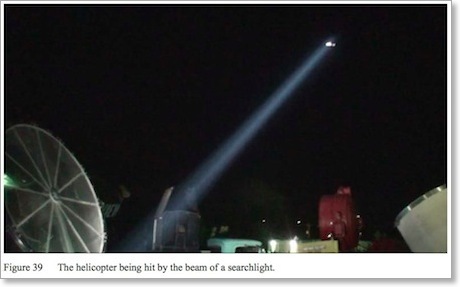 First, the researchers aimed six types of high-intensity searchlights at the helicopter. These sources included a carbon arclight, an HID arclight, an HMI “Dominator”, and a 4K xenon Skytracker. Then, they also used a high-power handheld flashlight. Finally, for comparison they aimed a 3.5mW green laser pointer, purchased from RadioShack, at the helicopter. At distances from 200 to 500 meters, the helicopter pilot "never experienced any adverse effects of the light beams, and had no problems reading his instruments or viewing outside.... The pilot showed no signs of irritation and did not frown or look away or close his eyelids.... The amount of glare was minimal and had no effect on the ability of the pilot and experimenters to view the instruments in the cockpit and the outside world immediately surrounding the light source." In addition, the laser pointer caused flashblindness and afterimages, while the searchlights did not. In contrast, the laser beam was not seen until it was almost at the helicopter. “The laser beam was generally an unexpected insult, thus causing additional startle." Toet, A., van der Leden, N. & Alferdinck, J.W.A.M. (2009). The outdoor use of lasers and other high intensity light sources in relation to air traffic safety (Report TNO-DV 2009 C264). Soesterberg, The Netherlands: TNO Defense, Security and Safety. The complete technical report is available on the Files and Documents page.